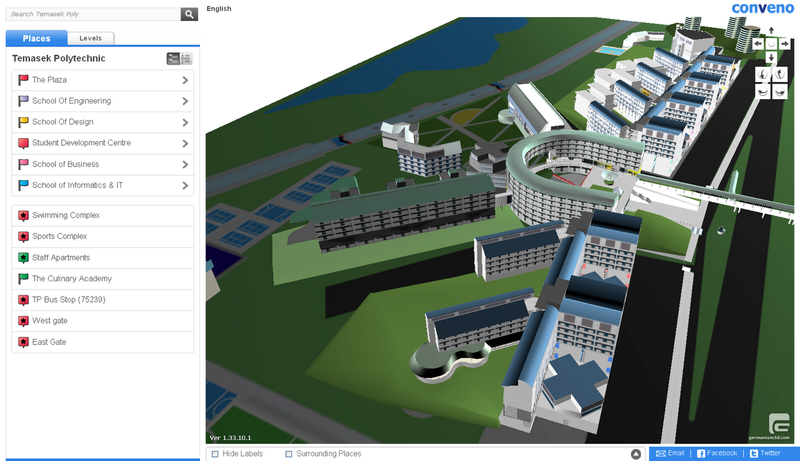 G Element is proud to have collaborated with Temasek Polytechnic to develop the 3D e-directory of the Temasek Polytechnic campus, using Conveno’s 3D way-finding software-as-a-service. In this collaboration, Temasek Polytechnic Engineering students developed the interactive-quality Temasek Polytechnic 3D campus model for their final year project, using real-time 3D modeling guidelines. 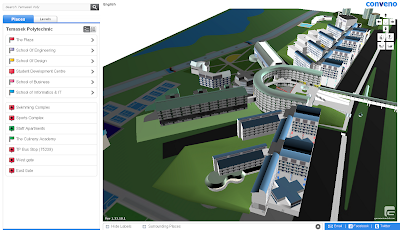 Upon the completion of the 3D campus modeling, the students were trained by G Element staff on using the online Conveno Editor Content Management System to set up their 3D e-directory. The final achievement is an intuitive and real-world 3D directory guide of the Temasek Polytechnic campus, that is useful for orientating campus visitors and new students, as well as showcasing the campus facilities. In recognition of the team’s achievements, the 3D e-Directory won a Merit Award and was showcased at the Temasek Polytechnic Open House in 5-7 Jan 2012.